Here is a list of 3 Best Free Road Trip Planner For Windows. Download these free trip planner software and plan your trip easily. Create your own route and track it in real time. You can customize your journey with various available activities, like hiking, walking, driving, motorcycling, mountaineering, ATV, truck bike, off-roading, etc. I have also listed a free road trip planner which comes with a list of hotels, restaurants, and more. It also displays the information of hotels and restaurants including price, address, contact number, etc. Moreover, some must-visit places for kids are also listed in it. Read the article to know more about it. One of these route planning software comes with a Find feature. Using this feature, you can easily find famous adventurous spots, addresses, etc. Apart from this, you can also transfer the location between PC and a device connected to it. Garmin BaseCamp is my favorite road trip planner software. First of all, it offers a lot of customization options as compared to the other journey planner in this list. It also shows you the famous tourists spots along with their ratings submitted by people. Moreover, you can also rate a place which you visit by creating an account on its website. In addition to this, it also shows you the uploaded images and videos of tourist places. You may also like some best free Satellite Tracking Software and Schedule Maker Software for Windows. Garmin BaseCamp is a free road trip planner for Windows. Using this free software, you can plan your trips easily. You can create a route of your journey on your own and track the created route. On your route, you can also mark more than one waypoints. You can customize your adventurous activities by selecting any of the available activity profiles such as hiking, walking, driving, motorcycling, mountaineering, ATV, off-roading, etc. Find Points of Interest: Selecting this option, you will find all points of interest, like tourist spots lying under/nearby the area of your trip, etc. Find Addresses: This option lets you search for a particular location on your route by entering the address. Find Adventure: This option is helpful for you if you are looking for some exciting adventurous places (like wildlife sanctuaries, biodiversity parks, etc.) to visit during your trip. It gives you suggestions of the places that you should visit. Besides this, it also displays the distance of the adventurous spot from a particular place, the time taken to travel, and the ratings of each adventurous spot. You can also give your own ratings to any spot as per your visit and submit it to Garmin BaseCamp database. But, the submission of ratings requires an active Garmin BaseCamp account. Moreover, as you click on any of the adventure spots, it displays the photos and videos of that place. You can also share that particular image or video with your friends via Picasa. Send to a Device and Receive from a Device are two more useful features provided in the software. Using these features, you can easily transfer any location between the PC and a device connected to it. This free trip planning software also features a measurement tool which lets you measure the distance from one point to another or among multiple points on the map. After planning a trip, you can export it to multiple formats which include GPS eXchange Format, Garmin GPS Database Files, CSV, KML, etc. All in all, Garmin BaseCamp is one of the best travel planner software for Windows. Tripwolf – Your Travel Guide is a free Windows 10 road trip planner app. The free version of this app has a limitation that it lets you download the content of one country or one city for free. If you download the country, you will be able to view most of the cities of that country. Hence, it is better to download the country instead of downloading a single city. To do this, you have to enter the name of a country/city in the search tab and hit enter button. But, not all content of a country is available for free. To test this app, I added India to my list. It displays a brief introduction of every city and country. The interface of this software is divided into 6 categories, namely, Tripwolf Recommends, Regions, Accommodations, Cities, Tours & Activities, and National Parks. Tripwolf Recommends: This section provides you the recommendations from the tripwolf team. These recommendations include some highlights of the country, places for kids, places for budget-minded tourists, top destinations, places which you enjoy in any weather conditions, and some world-class hotels to stay. Regions: This section includes some must visit places/regions. Accommodations: This section comes with a list of a good number of hotels. You can click on any of the hotels to know whether it lies under your budget. It shows the starting price of rooms for some hotels. Also, for expensive hotels, High-End message is shown in the price level section. All the hotels are displayed with the user ratings which also help you select the best of the available. You will also get the complete address of a hotel. More information includes fax number, telephone number, number of rooms, atmosphere, etc. Cities: It comes with a list of cities of a country. Select the city which you want to explore. For each city, you will get the following options: tripwolf recommends, tours & activities, accommodations, shopping, neighborhoods, attractions, gastronomy (contains the list of restaurants), transportation, and nightlife. Tours & Activities: Here, you can book your tour from the list of available guided tours. National Parks: This section comes with a list of some national parks and wildlife sanctuaries of the country. 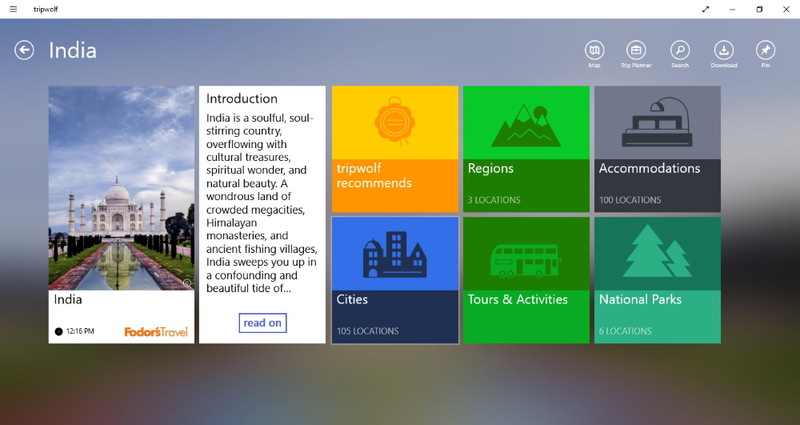 Tripwolf is a good Windows 10 road trip planner app which helps you organize your trip better. ITNConverter is actually a two-in-one software which is not only a trip planner, but also a route converter software. It is a very simple software in which you can prepare routes easily. It comes with more than 40 built-in maps to select from. Some of these maps are Google Maps (Satellite), Google Maps (Terrain), Google Maps (Hybrid), HERE Maps (Satellite), HERE Maps (Hybrid), Japan Topographic Maps (Terrain), Mappy Maps (Hybrid), Mappy Maps (Satellite), New Zealand Topographic Maps (Terrain), Open Street Map (Terrain), OpenTopo Map (Terrain), Bing Maps (Satellite), Bing Maps (Hybrid), ViaMichelin Maps (Hybrid), etc. 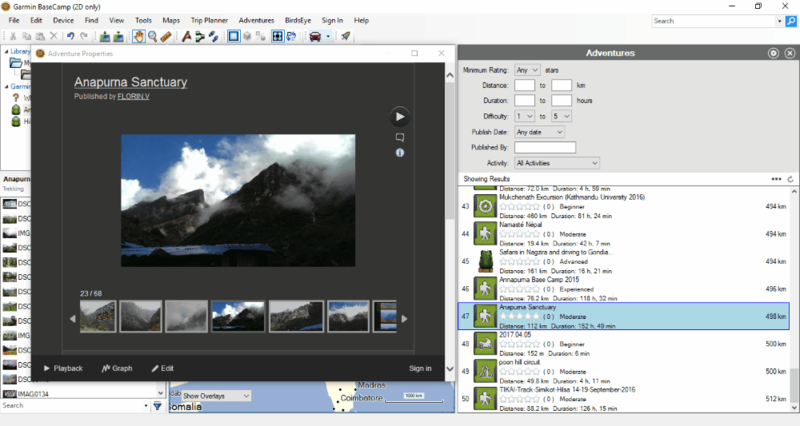 After launching the software, click on Editor button to launch the map. In order to plan a route, first, you have to mark the starting point on the map. Search the starting location for your journey by typing its name in the search tab and hit the enter button. For example, if I want to start my journey from New Delhi, then I type New Delhi in the search tab. It then shows all the places matching the name thus entered. Select the place from where you want to start your trip from the list. The searched place is also displayed on the map from where you have to select Add To Iternity option in order to add it to the waypoints list. Or, you can add any place to the waypoints list simply by double-clicking. There is no limit to add the waypoints. All the added waypoints will be displayed on the map with numbering. You can connect all the waypoints with one another by clicking on “Get Directions for This Segment” option. If the connection between any two waypoints (places) is not possible via road, “unable to get the directions” message is displayed on the interface. It also has an Add To Favorites feature which lets you keep your favorite places at one place in the software. You can export the list of all cities added on the map in multiple formats, like CSV, XML, GPX, AXE, PTM, EST, etc.